The Tablet of Memory is a marble honour roll commemorating those from the district who served in World War One. On Anzac Day the commemoration service and unveiling of the Memorial Tablet was attended by over 300 people of Trundle and surrounding districts. The unveiling of the Memorial Tablet was performed by Major McKenzie, D.S.O. General Sir Charles Cox had arranged to visit Trundle for the unveiling, but owing to illness was prevented frommaking the trip. Mr. J. Medlyn (President of the War Memorial Hall and School of Arts) occupied the chair, and Revs. King, Reekie and Barrett, Major McKenzie, Lieuts. Whitlock and Mailer, Mr. McKinnon (President, R.S. and S.L. League, Trundle branch) and Mr. McLellan assisted at the ceremony. A motion of "Loyalty" was proposed by Mr. McLellan and seconded by Rev. Barrett. Both speakers had a splendid grip of their subject and gave very interesting addresses. 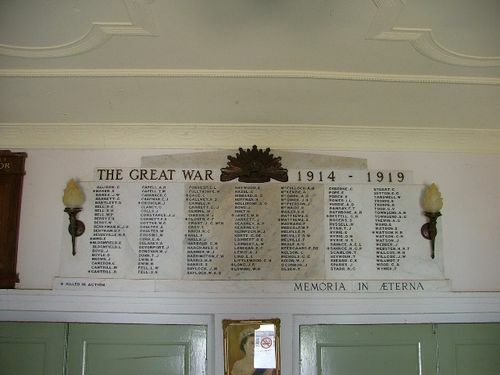 The Chairman then called on Major McKenzie, on behalf of the citizens of the district of Trundle, to unveil a Tablet of Memory, whereon are engraved the names of those who served their King and Country in the Great War. Major McKenzie then drew a Union Jack which covered the Tablet, and complimented the people on the fine Tablet and War Memorial which they had erected in memory of the soldiers. Mr H. R. Mailer read from the Book of Remembrance the names of those who fell at the War. The "Last Post" was sounded, the people stood in silence and then the "Reveille" was sounded. The Memorial Tablet is a splendid piece of workmanship, in white marble with lead lettering, and contains 150 soldiers' names. Western Champion (Parkes, NSW), 1 May 1930.